The combination of chocolate and banana is highly underrated. Aside from some frozen bananas dipped in chocolate, and chocolate chip banana bread, the combination is largely overlooked. 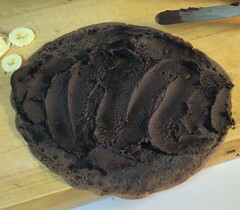 Well, break out your bananas because we are going to make something that will make chocolate lovers rejoice. 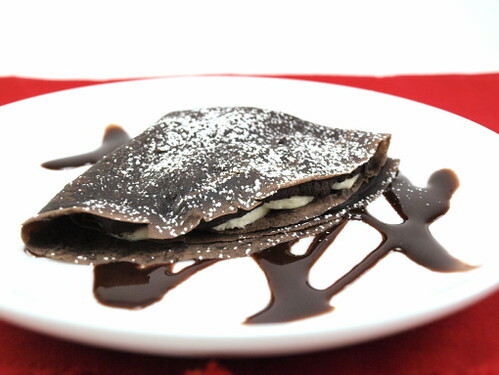 The crepes are chocolate but they do not have any sugar in them. Before you say I am mad consider that the crepes are going to be filled with bananas which are naturally very sweet. 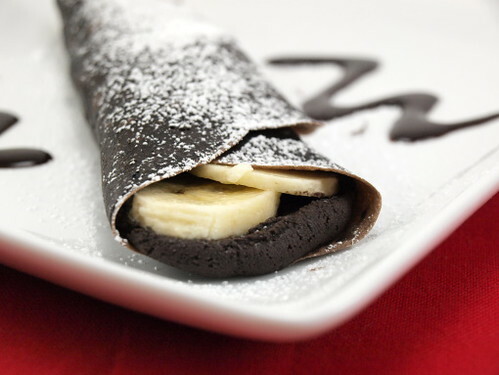 Along with bananas there is a rich, bitter-sweet, chocolate mascarpone filling, and once plated the crepes are dusted with powdered sugar. With all that sweetness the crepes themselves needed to be bitter to provide a nice contrast in flavor. 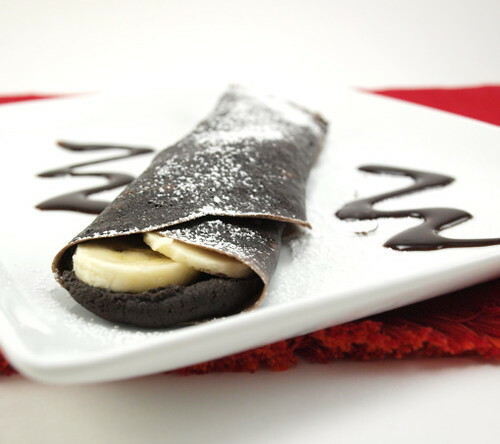 If you love chocolate and bananas then you need to make this recipe. 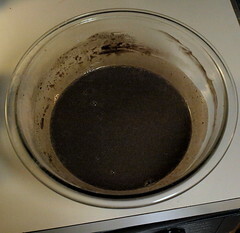 Combine the cocoa, eggs, vanilla, and coffee liquor in a large bowl until well combined. Whisk in the flour and butter and mix until there are no lumps. Set aside. In a heavy sauce pan scald the milk (bring to a low simmer before removing from the heat). Add 1/4 of the hot milk into the egg mixture, whisking constantly, to temper, then combine the remaining milk. Chill the batter for 30 minutes. 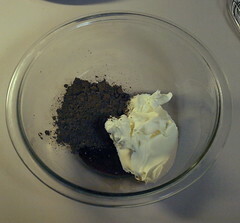 In a medium bowl combine the mascarpone, cream, powdered sugar, cocoa, vanilla, liquor, and salt and mix until smooth and well combined. Set aside. 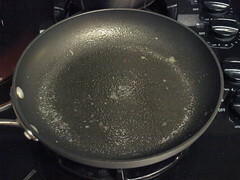 After the batter has chilled, place an 8″ non-stick omelet, saute, or crepe pan over medium heat. Spray it lightly with non-stick cooking spray. 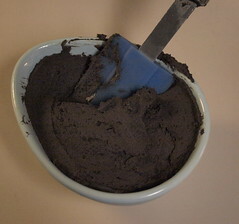 Pour 1 1/2 ounces (about 1/4 cup) of batter into the center of the hot pan an swirl the pan until the batter coats the pan evenly. 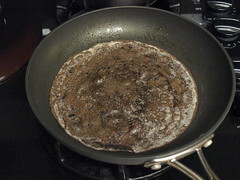 Cook until the edges release from the pan and the underside of the crepe slides easily in the pan, about one minute. 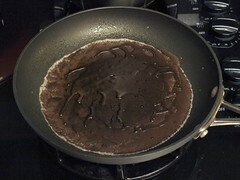 Flip the crepe, or turn with a rubber spatula, and cook for 30 seconds to 1 minute on the second side. 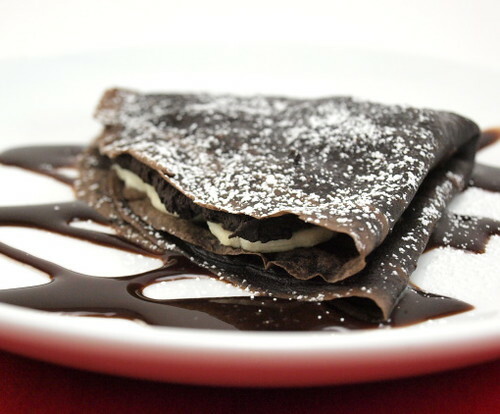 Remove to a plate and stack the cooked crepes between layers of parchment or wax paper. To assemble spread a thin layer of the mascarpone mixture on the center of the crepe. Lay a line of bananas down the center then roll into a tube. 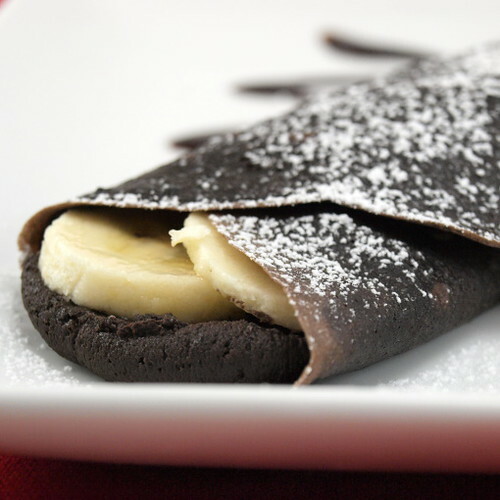 Alternately, you can spread the mascarpone over 1/4 of the crepe, lay a few bananas on top then fold the crepe in half, and then in half again.